The Reblochon cheese from the Haute Savoie is the most popular of all the cheeses from this region. Not surprisingly it also has the highest production in the region. This cheese has been granted the prestigious AOC* title since 1958. 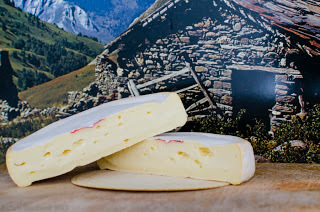 Reblochon was first produced in the Thônes and Arly valleys, in the Aravis. Thônes is the centre of Reblochon production today and the cheeses are still made in local cooperatives. The word Reblochon comes from the french word ‘reblocher’ which when translated means ‘to pinch a cows udders again’. We have been told this wonderful story of the historical origins of this…During the 14th century when landowners taxed the mountain farmers according to the quantity of milk their cows produced, the farmers got wise and didn’t fully milk their cows in the mornings. They waited until the landowners had measured the quantity of milk produced and then later the cows had a second milking! This milk produced later was richer and creamier and the dairymaids used this to make their own cheese. Reblochon is a soft ‘washed rind and ‘smear ripened’ cheese traditionally made from cows milk. The cheese is 14cm in diameter and about 3-4 cm thick. It normally weighs around 450g. The rind of the cheese is a yellowy orange colour with a thin white layer of mould on. The bacteria is smeared onto the rind, this gives the cheese a stronger flavour as it ripens. When buying Reblochon from our local Fruitiere they ask whether it is for eating or cooking, as there are different qualities and ages of the cheese. The cheese is marked with either a green seal in the skin denoting it is Reblochon Fermier – the top quality or with a red seal which means it is the standard quality. The diary farm in our little village supplies milk for the local Fruitiere for cheese making. The breeds of cows best for producing the milk for Reblochon and other local cheeses are Abondance, Tarentaise and the Montbéliarde. I believe these are all brown and white cows. 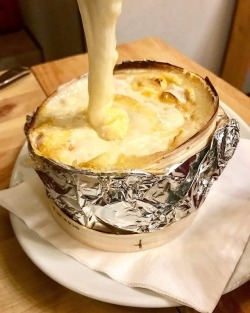 Tartiflette is probably the most famous Savoyard dish – the main ingredient being Reblochon. This is a gratin made with potatoes, onions and bacon lardons. I’m not sure I’ve been in a Savoyard restaurant here that doesn’t have at least one Tartiflette on the menu. *appellation d’origine controlee (AOC) is the French certification granted to some French geographical indications for wines, cheese, butter and various other agricultural products. When a product carries the AOC title it is subject to a rigorous set of clearly defined standards. 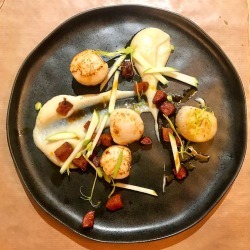 These are that the product will be produced in a consistent and traditional manner using ingredients from specifically classified producers in designated geographical areas. Around 40 cheeses have been awarded an AOC label.